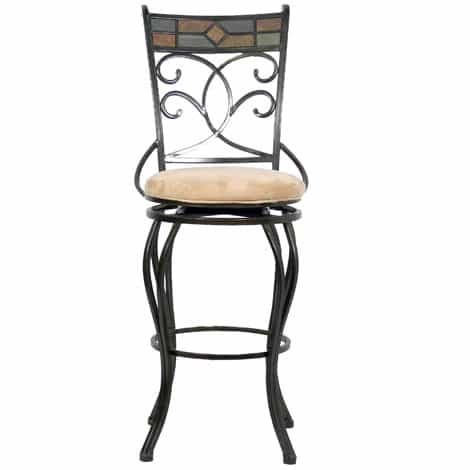 The Pompeii Bar Stool by Hillsdale features the classic beauty of ancient Roman architecture and ornamentation. The stunning back features a gorgeous natural slate mosaic accent which will bring an earthy appeal to your decor. Hillsdale has designed the metal frame for complete drama, with elegant scrollwork and marvelously curving legs. The Pompeii has a comfortable beige fabric padded seat with a contrasting black gold finish. The swivel mechanism ensures accessibility, and the armless design allows you to tuck this stool away when not in use. The Pompeii is available in both bar and counter height versions.